Anyone who’s belted a little white ball around a fairway will probably have heard of St Andrews. Apart from its historical links with golf though, this is one of Scotland’s most charming and enjoyable towns to explore. Walking around The Scores, with the wide sweep of St Andrews Bay set against the surprisingly intact medieval layout and dramatic ruins of the town, evokes a feeling of being on a film set – it’s all so picture perfect. The town is blessed with a thriving café and pub/ bar scene and many fine restaurants. St Andrews is said to have been founded by St Regulus, who arrived from Greece in the 4th century bringing the bones of St Andrew – Scotland’s patron saint. The town soon grew into a major pilgrimage centre and St Andrews developed into the ecclesiastical capital of the country. The university was founded in 1410, the first in Scotland. By the mid-16th century there were three colleges, St Salvador’s, St Leonard’s and St Mary’s. St Andrews is perhaps most famous for its historical links with golf. It’s the headquarters of golf’s governing body, the Royal and Ancient Golf Club. 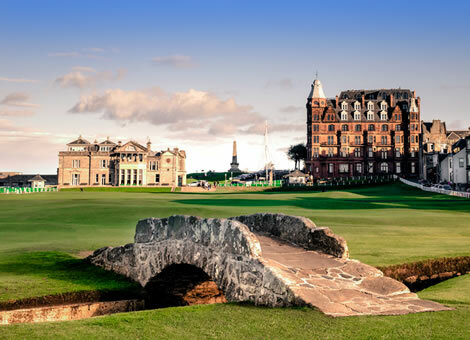 It’s also the location of the world’s most famous golf course, the Old Course. The British Open Championship has taken place regularly at St Andrews since 1873. St Andrews is a must see on your Scotland tours.